The suspects are also charged with other attacks on business people in Kyiv. The police detained five suspects in the murder of the former acting CEO of the state-owned distillery concern Ukrspyrt, Viktor Pankov. "The criminal activity of the group that killed and abducted people in Kyiv was stopped," the chief of National Police, Serhiy Knyazev, told a briefing in Kyiv on Tuesday, 26 December. According to Knyazev, five detainees were implicated in the beating of a businessman on 29 March, an explosion near Kyiv University on 1 May, and an attempt on another businessman on 23 June. The detainees, arrested in the territory of a neighboring state, are also suspected of Pankov's murder, Knyazev said. 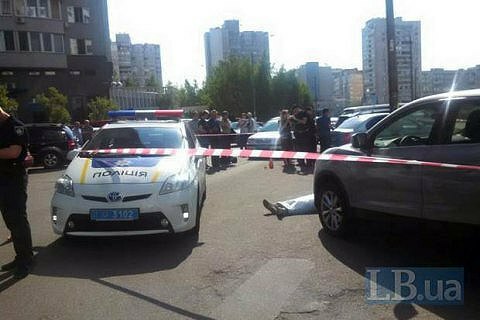 On 30 May, an unidentified gunman shot dead the former CEO, an advisor to the current director of Ukrspyrt. The killer could not be detained in the hot pursuit, but the police later said they had identified the suspected killer. In October, media said that environmentalist activists are suspected of the murder.